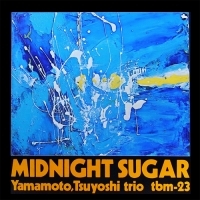 Few, if any, international audiophile jazz recordings have maintained the kind of deep and profound influence over techniques and even entire label repretoire as Three Blind Mice's Blow Up, Midnight Sugar and Misty. The of-the-moment realism of Yoshihiko Kannari's recordings and production aesthetic of producer and label head Takeshi "Tee" Fujii have been the benchmark to match. It is to their immense credit that Blow Up, Midnight Sugar, and Misty have yet to be matched, even 40 years later.